In his January 17th article, he made a couple of points with which I strongly disagree. 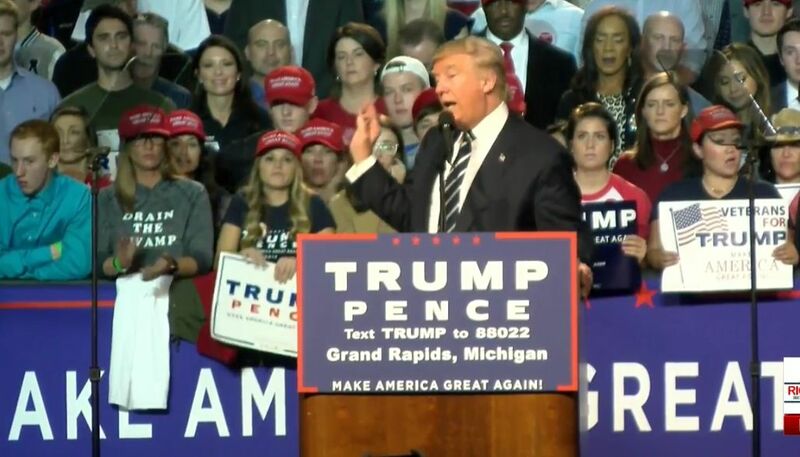 First, he claims the Democrats have become increasingly a ‘presidential party’ at the expense of down-ballot offices. This point has been made by many other pundits, most recently in Politico by Edward-Isaac Dovere. While the claim is defensible, the campaign finance evidence is mixed, if not contradictory. Have the Democrats’ increasingly funneled money to the party’s presidential campaign when some of that money should have gone to Democrats in down-ballot races? The problem is with the data. Its difficult to prove this claim one way or the other, in part, because there is no central resource for knowing exactly how much money is spent by politicians in state and local races. Campaign finance compliance and reporting rules vary by state and aggregating all of this money into a total number is problematic. Yet, we can look at the percentage of federal election campaign expenditures that go to the party’s presidential campaign versus the U.S. House and Senate races. If the Democrats have become more of a ‘presidential party’ we should see a higher percentage of campaign expenditures spent by Democratic presidential candidates compared to the total spent by Democrats running for the U.S. House and Senate. 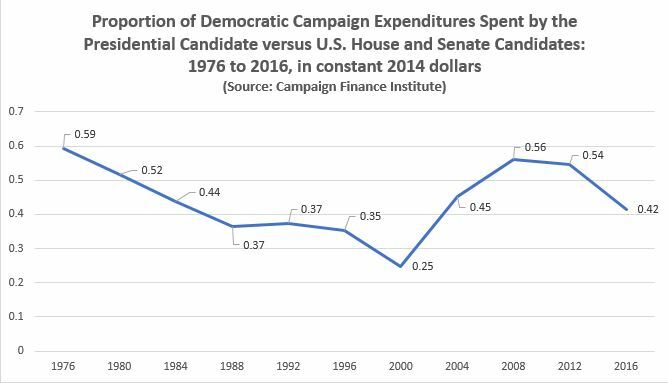 The chart below summarizes the campaign expenditures of Democratic presidential candidates relative to other federal races since 1976. It may surprise some that Jimmy Carter’s 1976 campaign accounted for a higher proportion of total Democratic campaign spending than any campaign since. Only the two Obama campaigns come close (56 and 54 percent, respectively). Hillary Clinton’s 2016 campaign accounted for only 42 percent of all Democratic federal campaign expenditures — which is about average. If you want to argue that the Democrats are losing U.S. congressional and state legislative elections because of an over-emphasis on presidential campaigns, it will require a more sophisticated understanding of how campaign dollars impact elections at all levels and how this spending interacts. For example, do local and state candidate gain more or less synergy from higher presidential-level spending than they do from spending by U.S. House and Senate campaign? Or perhaps there is no relationship? Its also important to note that the loss of local, state, and U.S. congressional seats also occurred for Democrats in midterm elections which are not affected by a presidential race. So, blaming the fundraising prowess of Democrats’ presidential candidates for the party’s declining success in other races seems unwarranted. The second point from the Kroeger article that eats my grain is the contention that the Democrats are so far behind the Republicans at all levels of government that it will take a decade to recover. When you recite the current numbers it does sound bad: the Democrats are down 47 seats in the U.S. House, down three in the U.S. Senate, have just 16 Governors and control only 18 state legislatures. But I will contend that the party’s troubles are exaggerated at all levels of government, but particularly at the national level. I agree that the Clinton popular vote is a biased measure of the Democrats’ national strength, but it is equally foolish to think the Democrats aren’t close to having a winning presidential coalition. They are close. Very close. And only minor shifts in turnout and support levels in a few key demographic segments (most notably working-class voters) would have changed the 2016 results in Clinton’s favor. The task for the Democrats is greater at the congressional level, but far from irreversible. Regaining the Senate will have to wait until after the 2018 midterms where the Democrats are protecting 10 incumbent Senators in states Trump won. They will be lucky to hold serve in 2018. It’s 2020 where the Democrats will need to focus on getting back the Senate. As for the U.S. House, it will take 24 seat flips for the Democrats to regain power. If we look to history as our guide, that is not a big number to turn in just one election cycle. Since Eisenhower, four out of nine midterm elections under a Republican president saw the Republicans lose at least 24 seats to the Democrats. I do not dispute that the Democrats are in the political wilderness right now. Their most prominent leaders are old, they rely too much on a patchwork of unconnected issue positions, and don’t provide a coherent organizing principle voters can use as a heuristic device to navigate the political environment. Yes, the Democrats are in the forest, but its Virginia’s Shenandoah Forest not Alaska’s Tongass Forest. They are close to regaining power at the national level and are far from facing an existential crisis at the local and state levels. Add to this optimistic view that the long-term demographic changes in the U.S. will most likely work in the favor of Democrats and it is hard to feel to bad for them. The greater challenge may be convincing the Republicans that can’t continue their success without winning the support of more women, minority, and younger voters. In my view, those are the battle lines that will define future elections and the Democrats are more than capable of winning on those fronts. Democrats, here’s my short-term advice: Don’t watch TV tomorrow or this weekend. Go to the movies and see Rogue One for the second time, or just go to dinner and relax. Boynton Brown’s last comment shouldn’t startle most people. But within the Democratic Party and its scholar-bureaucrat class, her voice is almost alone in contending that this country has taken a definitive turn to the right. In fact, the Democrat literati continue to push an astigmatic fiction that this country is becoming more liberal and the American people are more aligned with the Democrats than the Republicans on an issue-by-issue basis. Issie Lapowsky’s Wired article, “Don’t Let Trump’s Win Fool You – America’s Getting More Liberal,” provides one of the better attempts at justifying this conclusion, but there are others as well. Peter Beinart’s Atlantic article, “Why America is Moving Left,” comes to mind because it came out just as the 2016 primary season started and seemed destined to find its own proof in the election of a Democrat (or reasonable Republican) president in November. Ooops. But more people are probably exposed to the ‘liberal America’ case from the news entertainment class, where the argument burns white hot. Filmmaker Michael Moore made the claim in 2011, and did it again recently with Bill Maher in their 2016 post-election wake. Moore even suggested firing the pollsters, which is a good idea if you want the policy preferences of Americans to be determined by media decree rather than by listening to the American people themselves. Understand, I love Michael Moore. He’s not just talented and funny, but unlike his ideological counterparts, he actually understands the lives of people outside the east and west coast elite circles. If Hillary Clinton had heeded his advice in this past election, she would be the president-elect today, instead eating over-priced New York City hamburgers with billionaire designer Ralph Lauren. And for those of you hard-working, 9-to-5 Democrats that thought Hillary Clinton understood your life and your issues, trust me, she’ll be spending the rest of her life avoiding people like you and your issues. Only billionaires and Hollywood celebs need apply to be her next dinner companion. Clinton’s tin ear to working-class people is a sharp contrast to Moore who is an empathic savant with respect to their daily lives. Yet, when Moore says we live in a liberal nation, he is just plain wrong. To refute his and others’ notion of ‘liberal America,’ I turn to Lapowsky’s article as she offers the most compelling argument in its favor. And, in her defense, I enthusiastically agree with her conclusion that America is increasingly a tolerant, inclusive society that welcomes immigrants, supports women’s privacy, is open to reasonable gun control legislation and expects the rights and dignity of all of our citizens to be protected, regardless of sexual orientation, religious preference, gender, race, and ethnicity. That is the America we live in, even if it did just elect Donald Trump. However, here’s the problem. Lapowsky (like others making the same claim) cherry-pick those issues where this country is more liberal and tolerant and subsequently avoid most of the bread-and-butter issues — attitudes towards taxes, regulations, national security, crime and the role of government — that play a much bigger factor in people’s vote decision. When analysts and academics look at a broader palette of issues they see a country that is more conservative today than at anytime since 1980. The chart below shows one such analysis conducted by the University of North Carolina’s James Stimson who has created a “policy mood’ index derived from thousands of responses to hundreds of specific policy questions over time. A more detailed description of his methodology can be found on his website. In contrast to Lapowsky’s selection bias problem, Stimson’s comprehensive accounting for a much wider range of policy opinions reveals meaningful changes in America’s public mood that correlate with shifts in political and policy outcomes. 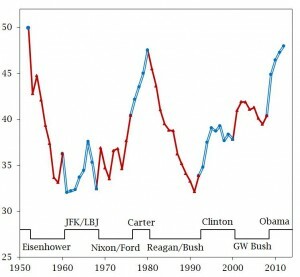 For example, we see the peak of conservatism in the late 1970s leading to Ronald Reagan’s election in 1980. Subsequently, as Reagan’s policies were implemented, we see a public mood swing back in the liberal direction, a predictable “correction” process that often occurs when new presidents take office and inevitably over-reach in their pursuit of their preferred policy initiatives. This correction process is also evident soon after Bill Clinton took office in 1993 and after Barack Obama entered the White House in 2009. Quite markedly after Bill Clinton’s first presidential election, the change in public mood (in the conservative direction) has tracked closely with the secular decline of Democrats in our nation’s state legislatures (see chart below). Apart from a temporary recovery during Obama’s rise, the trend for Democrats has been a virtually uninterrupted, monotonic decline in our state legislatures. Today, there are almost 1,000 fewer Democratic state legislators than Republican. If past variation is an indicator, it will take a decade for the Democrats to close that gap. Of course, an over-reaching Trump administration accompanied by disastrous results could speed up that recovery process; but at this point, if I were the Democrats, I make no assumptions in that regard. The current obsession among Democrats with Russian electoral shenanigans and FBI Director James Comey’s letter postpones their need to assay their electoral decline. Whatever the final conclusion of the likely congressional inquiries into Russian interference in this last election, it will not provide information about the health of the Democratic Party. The impact of the Russians and the Comey letter are limited to 2016. They tell us nothing about why, at every level of government, the Democrats are worse off than any time since the Great Depression. The Democrats’ problems are deep-rooted, not transitory phenomena. Boynton Brown’s competition for the chairmanship include Minnesota U.S. Rep. Keith Ellison, Labor Secretary Tom Perez, South Carolina chairman Jaime Harrison, and New Hampshire party head Ray Buckley. Among them, only Boynton Brown has taken the first step necessary to solve any problem. She recognizes the problem. The Democrats are in decline, in a serious way. I’m not surprised someone from a red state like Idaho would be speak so realistically about her party. 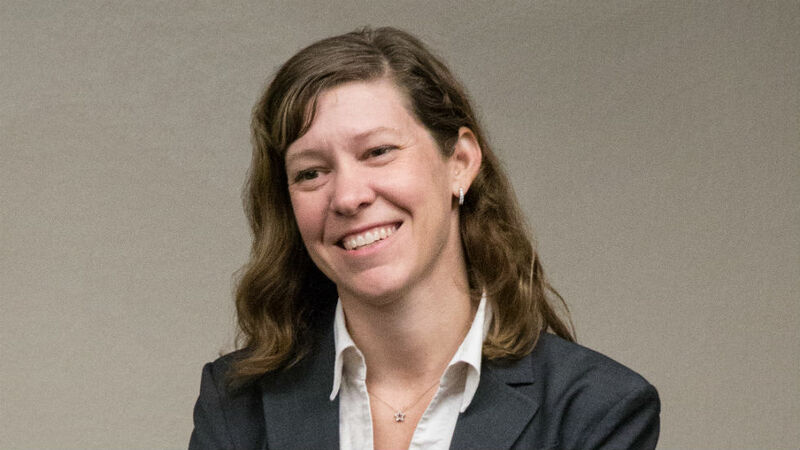 In my own experience, having recently managed a Democrat challenger’s state legislative campaign in Iowa in 2016, I saw up close the disconnect many working-class Democrats feel with their national and state party. The Democrats just don’t talk to them anymore. Virginia Senator James Webb summarized this attitude best: “They don’t think Democrats like them.” Boynton Brown is correct when she says the Democrats need to do more than just expand their tent, they need to “blow the walls” off their tent. So when Ellison talks about “championing the challenges of working families and giving voters a reason to show up at the polls in 2018 and beyond,” or Perez says,”I’m in this race because we’ve got a lot of fighting to do, we’ve got a lot of advocating to do,” it demonstrates their poor understanding of the Democrats’ intrinsic problem. The Democrats have a strategic problem, not a tactical one. By deceiving themselves into thinking they are still the majority in this country and if they just work harder they will return to power, the Democrats are avoiding the tough questions. Boynton Brown nailed the issue right out of the gate: This country IS becoming more Republican and if the party leadership doesn’t recognize that reality, the Democrats will be a minority party for a long, long time. Yes, 66 million people voted for Clinton to Trump’s 63 million. But, overall, 71 million people voted against her. 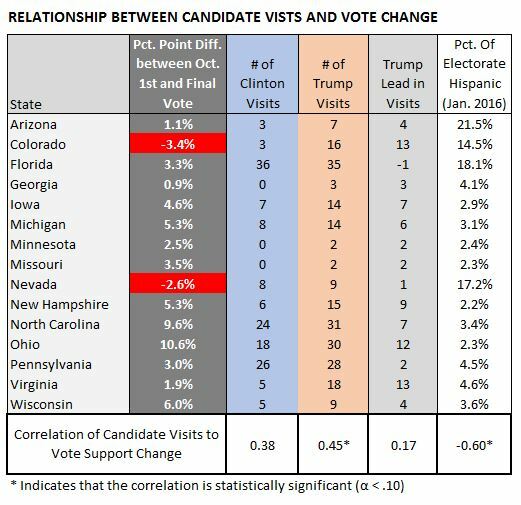 Furthermore, Clinton’s popular vote advantage reflects the significantly more money she had to spend on national TV advertising; such that, in states like California or New York, the presidential campaign they saw was measurably different from the election voters witnessed in Wisconsin, Michigan, Ohio and Pennsylvania. 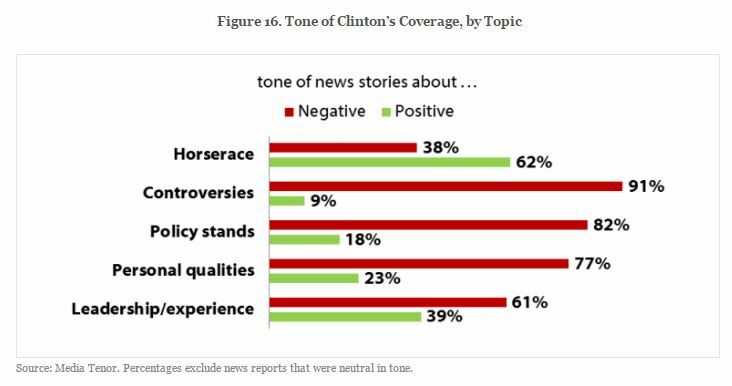 Include the national media’s total coverage of Clinton being more positive than Trump‘s (even with the help he received from the Russians and Comey), and you can see why Clinton had a quantitative advantage in the non-swing states. 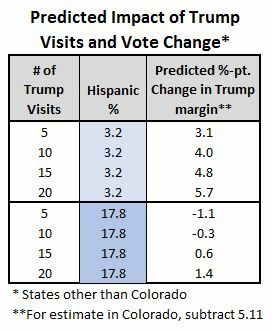 That is the source of Clinton’s popular vote victory. It was not a function of the Democrats being more popular than Republicans; and by not realizing that, the Democrats postpone their own recovery going forward. The Russians and Comey are tactical factors specific to one election. To explain the 40-year decline in Democratic state legislators one must investigate strategic factors such as the Democrats’ core messages or the disproportionate share of fundraising dollars going to presidential campaigns (Clinton, Gore, Kerry, Obama) at the expense of local and state races. The Clinton’s were master fundraisers. By aligning their messages (especially their private ones) with the financial, high technology, pharmaceutical, and entertainment industries, the Clintons beat the Republicans at their own game. It was brilliant and it kept them in control of the Democratic Party right up until they were eclipsed by Obama who had improved on their fundraising model. This strategy was great for the Clintons and Obama. Unfortunately, it also sucked the oxygen out of the rest of the party. For the Democrats to rebound in the legislatures and governors offices that fundraising model must change. Put aside the book’s title that already alienates most voters, that attitude towards the working-class is indicative of a viewpoint that sees working-class people as lab rats to be manipulated, not as human beings. 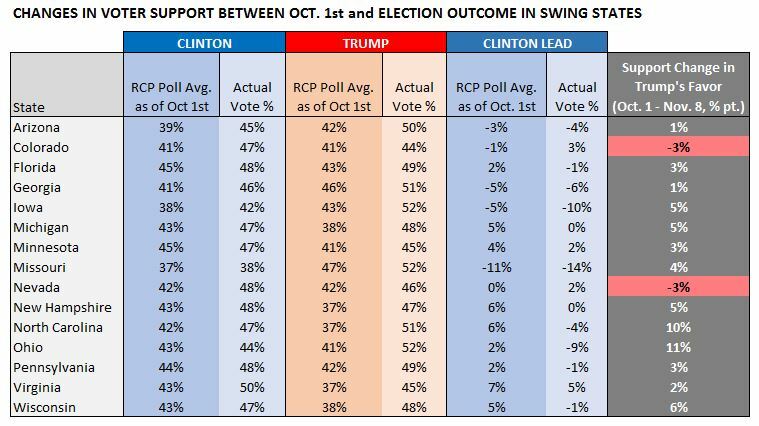 Furthermore, the polling data and the empirical research continually show how un-radical most Americans are when it comes to politics. And that’s a good thing because when the Trump administration over-reaches, it will be punished by the American voter. You can count on it. Sadly, that mainstream view Democrats can’t pull their messages from the same playbook and expect the electoral outcomes to be any different. They must throw out the playbook and reinvent itself. That will take new leadership from outside the beltway, be it someone like Boynton Brown, and a willingness to set aside past assumptions and to look at the American political landscape as if seeing it for the first time. That means the stilted rhetoric that still dominates Democratic communications must be abandoned. Through an open-minded inquiry, the Democrats must rebuild their brand by locating the strategic weaknesses in the Republicans’ brand — and there are many — and setting forth a vision that combines the party’s highest ideals, on the one hand, with the realities of governance, on the other. In Part 2 of this essay, I will provide some empirical evidence to show that whatever policies are advocated by the Democrats and Republicans in the future, they will be severely constrained by demographic and economic realities. As we stand today, the Republicans have a core message that works as well in today’s economic environment as it did when Ronald Reagan rolled it out in 1976 when he took on the American political establishment: Less government, more freedom. That message sells. 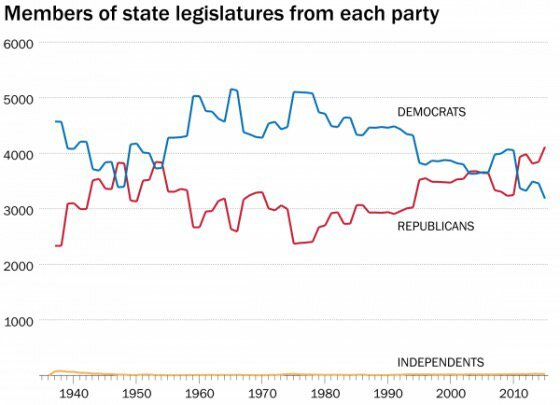 If you don’t think so, you need to stare at that second chart in this article showing the rise of the Republicans in the state legislatures. The Republicans are growing their market share; the Democrats are not. This didn’t just happen. Its been going on since 1980. And now the Democrats must finally address the problem. The governments in today’s advanced economies are about as big and intrusive as they can get relative to their total size. What voters will expect, therefore, is a party that can address the seen and unforeseen needs endemic to all societies (security, growth, opportunity, health), hold the government and its elected officials accountable when it fails to address those needs, all while ensuring the long-term fiscal health of the state well into the future. Not an easy task. And it will require ending government intrusions where they fail to help and moving some government functions to the lowest level of jurisdiction possible so that people can once again feel like they have some control over their lives.